For today's edition of There's Nothing New Under The Sun™, we have a radio engineer who experimented with creating high-tech fashion that would be right at home amongst the 21st century's glitch art and wifi visualizations. Except that these patterns were made in 1938. 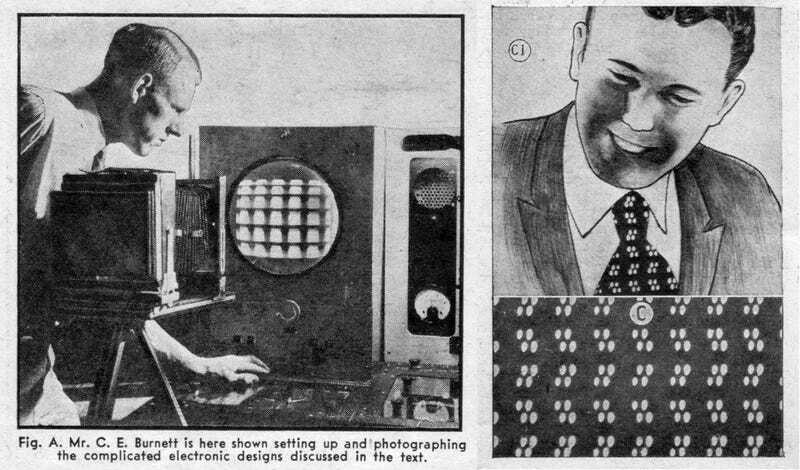 The July 1938 issue of Radio-Craft magazine featured photos of RCA engineer C.E. Burnett, turning radiowaves into patterns that could be used on clothes and furniture. Burnett was a radio and TV engineer and was inspired to turn the frequencies he saw around him everyday into practical textiles. In an article titled "Radio Creates Amazing Fashion Patterns," we learn about this new kind of art being created with a "radio kaleidoscope." By photographing a cathode ray tube (the same kind that would eventually fill American living rooms in the form of TV after WWII) and fiddling with the voltages and frequencies, the textile designer is able to create an "electronic snakeskin" pattern. The patterns could be used for any number of products from hats and shoes to bags and lampshades. The possibilities were endless, and imperfections were welcome, as the article noted. But it also wasn't just a guessing game. Through smart manipulation, you could get the kind of pattern you wanted. This finding of patterns through electronic means is by no means an entirely hit-or-miss affair. Research has proven that given frequencies may be relied upon to produce patterns of a certain sort. If, for example, a chain effect of linked lines is wanted, they electronic designer looks at his frequency chart, sets the controls and — presto! — a pattern similar to that used on the bracelet illustrated appears. I have yet to find any photos of Burnett's designs out in the real world and it's unclear from the article what became of this new high-tech inspired design technique. The article notes that surrealists artists would be "frantic with envy" over this method of creating visual art, but that it would find plenty of practical applications. Whether anyone actually took up the torch for these "electronic patterns" in 1938 is unclear, but whether he knew it or not, Burnett would prove decades ahead of his time.